Above: Peter Ash, of Lawford, Somerset has his hamster (Elvis) recharge his cell phone off grid. Are you and your pets going green? 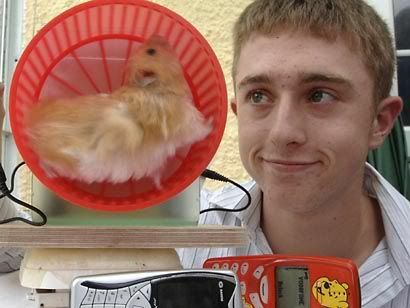 Peter Ash had a great idea on going green with his hamster Elvis. Too bad it didn’t make the grade, so to speak, because his project was only considered average (he got a “C” for the project). There are a lot of ways you can go green and take steps to become an eco-friendly pet owner but this trend seems to be lagging when it comes to the homes of many pet owners…so I thought I would share a few tips on how to go green. When it comes to keeping pets indoors (or under control when out in public) many pet owners fail. On first glance it doesn’t seem like this would be a problem but it is. Keeping pets in (or under control out in public) actually helps protect wildlife from habitat disturbances, disease, and predation. This is a big issue up in San Francisco where there is a dog war over the habitat disturbances of wild animals and dogs unleashed upon the area. Outdoor feline adventures also contribute to the millions of birds killed annually by domestic cats. Animal by-products (low grade waste from dead, dying, diseased, or disabled animals) are used in many pet foods. You are what you eat takes on a different meaning if you give it a little thought. Why would you feed your pet foods that are not fit for human consumption? Nutrition is important to disease resistance and for maintaining health–which will ultimately help you save on vet bills. Natural and organic pet foods are better for the environment and our pets. Consider supporting sustainable agriculture and humanely framed foods that don’t contain hormones and are minimally processed–it really is the way to go. Also avoid pesticides, hormones, antibiotics, artificial preservatives, artificial ingredients, and genetically engineered ingredients. 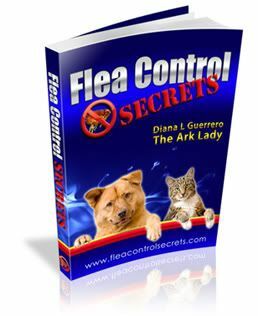 Cleaning up after your pet prevents the transmission of parasites and other diseases through the environment or the water table. Biodegradable poop bags or composting with something like the Doggie Dooley are better options than using plastic bags that stay in the landfills for eons. Cat owners are also encouraged to move away from clay litter because the clay is strip mined–which is not earth friendly. Try soy, wheat, or some of the other natural cat litters on the market. Don’t forget that clay litters contain silca dust or sodium bentonite–both can create problems for your kitty. Get crafty by making toys with recycled materials or by purchasing earth friendly toys supports sustainable manufacturers. Natural products & cleaning aids are safer for your pets, your family, and the environment. Contrary to popular belief, non-toxic shampoos and gentle cleaning aids get the job done just as well as those containing toxic chemicals. Grow your own–catnip or cat grass. Growing veggies is a great way to add good foods to your pet’s food bowl and there are many herbs can be used to make natural pest control products. Don’t forget that you can make toys from yarn or fabrics. Add your How to Go Green Pet Tips below! I’ll add that learning how to read labels and recognizing greenwashing with pet products can sometimes be difficult. For instance, most of the “biodegradable” bags on the market are not actually biodegradable. Make sure they meet standards for biodegradable claims (ASTM #DC6400-99 “Standard Specifications for Compostable Plastics” set forth by the U.S. Composting Council, AND new California law SB1749). Also, pet foods are pretty unregulated, so contacting a company to see where their ingredients are coming from is sometimes the only way to know for sure. A bag of pet food may say “made in the US” but still sourcing their ingredients from China. It’s a tough world to navigate, but well worth it! Yes, whether we know it or not there are a lot of ways that we contirbute to polluting our earth and this is one of them. Also, there is a lot of waste with toys and other things that could be avoided. @Amy Yes, it is difficult to identify the right products sometimes but changing habits and educating yourself about the products are well worth it. As far as the ingredients go, you have to find a savvy pet store to help…we have one that doesn’t have anything from China at all–including pet foods because they investigate all their product manufacturers and ingredients–guess we are lucky. Thanks for sharing the great info with other readers. @ForestWander Thanks for leaving another comment. Hope to see you more. I am one of those kind of retailers, too. We’re web-based with delivery in Chicago. Even though Chicago has a number of independent pet stores, there are questionable items in all of them and none of them discriminate when it comes to foods and treats made in China. They do a great job, mostly, but I have yet to see one that is uber-selective. Also, most companies are not forthright about where their ingredients come from, so I imagine they want to have a wide variety and let some things slip (or don’t contact the companies, since they don’t have to put the origin of ingredients and can still put “made in the us”). I’m not against my neighboring independent retailers at all, I just wish they were more selective. That’s why I started LWCD. I wanted a place where people can choose anything from the catalog and know that it’s healthy and eco-friendly. I’m glad you have an independent retailer that does this, too! I think there will be more and more, I just hope word continues to get out BEFORE there’s another large scale recall and before more of this smaller, quiet recalls continue. @Amy: Glad to hear that you are providing that much needed service. Yes, we are lucky and my guy is actually the food king (he gets into the details of the ingredients and where they come from and where the food is manufactured). I agree with you and think more and more specialty stores will be focused on ingredients…I believe that will be the new trend and is what will keep some businesses growing. Don’t use a lint roller! There is a new product called Fur-Zoff that’s made from recycled materials and it lasts nearly forever. Happy belated Earth Day! Thanks for the advice. Thanks for the tip about the product. That is a good replacement product–there is also a reusable sponge that is good for removing hair and sucking up accidents. I’ll be posting in the future about such items. I hope to see your comments again!